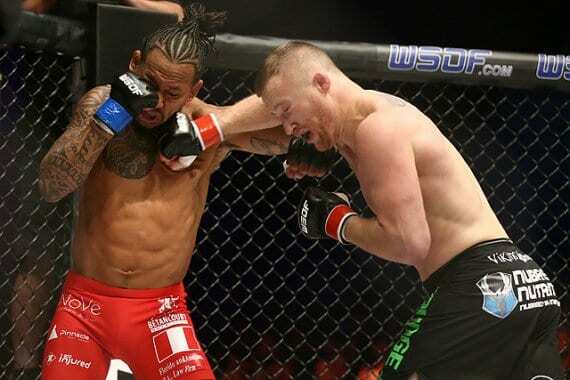 World Series of Fighting (WSOF) champion Justin Gaethje took on Luis Palomino in a rematch of their “Fight of the Year” contender at tonight’s (Fri., September 18, 2015) WSOF 23 Comerica Theatre in Phoenix, Arizona. The bout was similar to the first, with Palomino wobbling Gaethje with a flurry early on. The champ fought back with two solid takedowns and a huge uppercut, flooring Palomino to nail him with some elbows. In the second, Palomino came out strong with some elbows, only to eat a big shot from Gaethje. The fighters went to war with knees and traded low kicks. Gaethje hit Palomino with a stiff right, but he ate it. Low kicks from Gaethje thudded ‘The Baboon’s’ leg, and the champ kept pushing a nonstop pace. 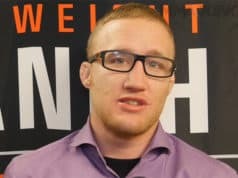 Gaethje dropped Palomino with a huge punch and a huge flurry of follow-up shots to earn the impressive stoppage and his second win over the always tough Palomino. Timur Valiev absorbed some damaging strikes, but largely outstruck and outgrappled Tito Jones on his way to a clear unanimous decision win. Despite eating some huge punches early, masked ‘superhero’ Phoenix Jones (AKA Ben Fodor) submitted Roberto Yong with an impressive first round leg scissors choke when he appeared he was looking for a kimura.